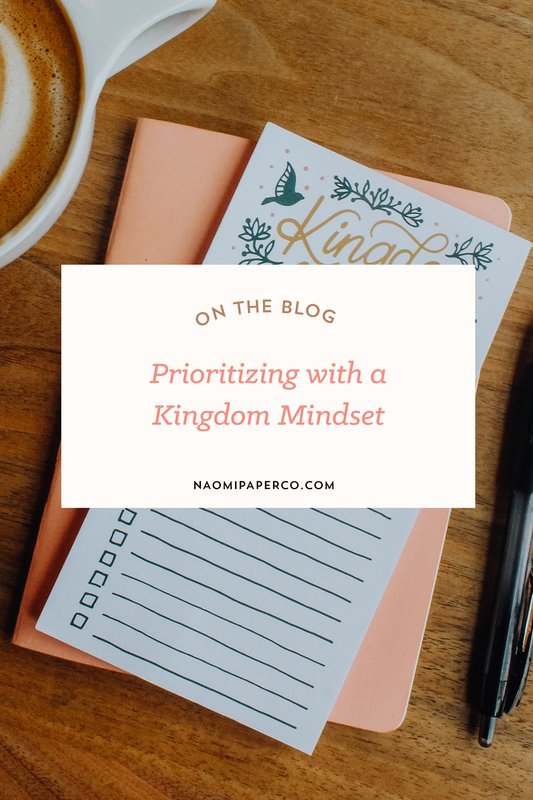 Prioritizing With a Kingdom Mindset — Naomi Paper Co. The world has a lot to say about how we should be spending our time, and how to get the most out of it. While I was starting Naomi Paper Co. my sophomore year in school, I felt the pressure on all fronts. My to-do list was long and my planner was full—and I was proud of it. The world’s advice worked! My business was growing! But my soul was suffering. None of the productivity advice I had heard seemed to mention that part. Or the burnout I would reach, or the sense of guilt I would feel for letting people down or not crossing each item off on my to-do list. What I didn’t realize was that living a life where I felt the need to constantly check all the boxes, was a lot like living under the law, instead of grace. And I have a feeling you’ve been there too. Through a couple of Instagram polls with my audience, I found that 82% of my followers make daily or weekly to-do lists, yet that very same percentage of people struggle to prioritize and complete those very tasks. How can that be? This command to “seek first his kingdom” may feel broad, vague, or intimidating at first. It might sound like we need to be like the disciples— dropping everything at once to live as a missionary. And maybe it does mean that for you. But more likely, it means choosing small daily acts of obedience to God that add up into BIG kingdom impact. So, who are you choosing to serve each day? 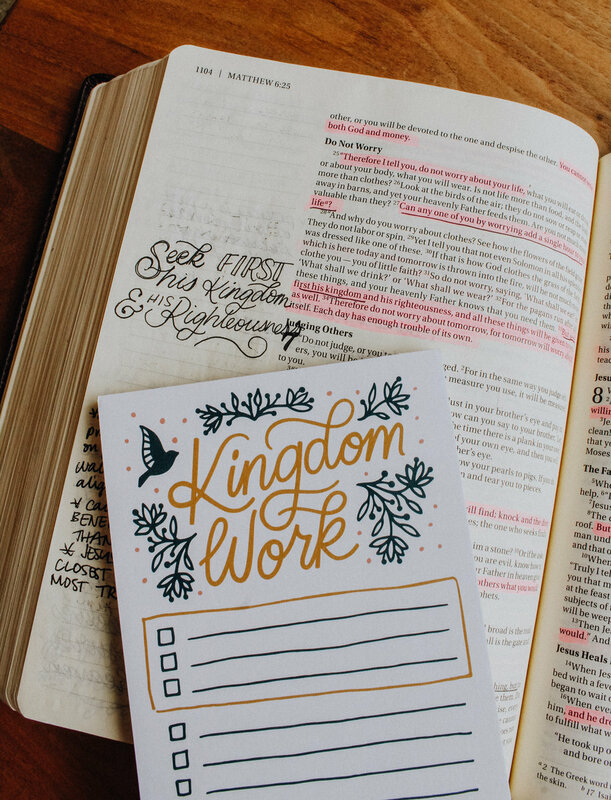 Whose kingdom are you seeking first? This can be hard to put into perspective for most of us, because usually the world doesn’t ask us to do evil things. In fact, it may ask us to do very good things. The problem is that when these good things come in contact with our sinful hearts, we are all too good at turning them into idols. So we end up placing them above our relationship with God and building a kingdom for ourselves instead. 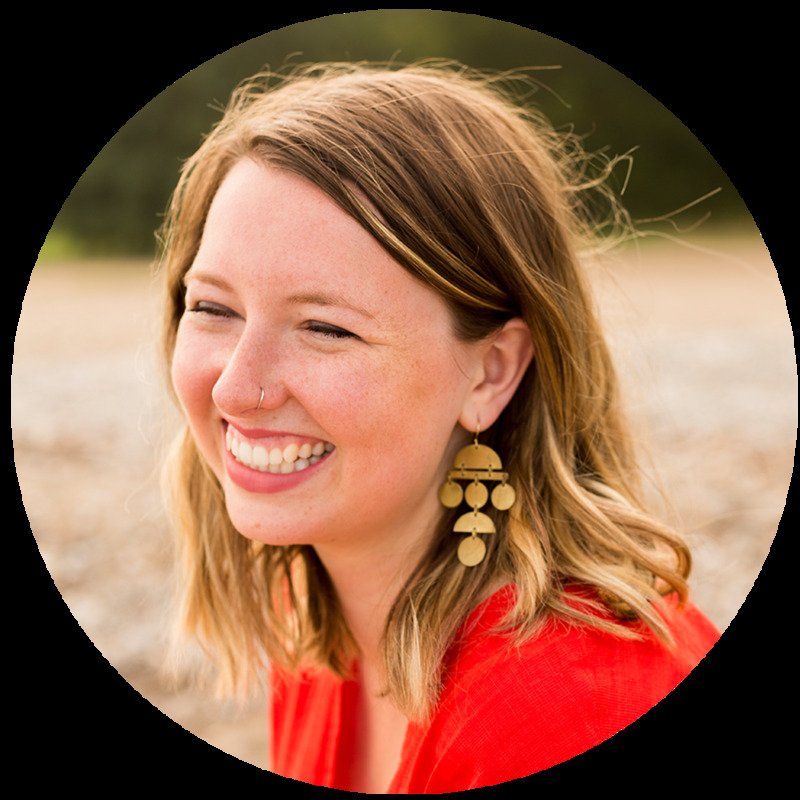 In light of these truths, and the cycle of burnout that I couldn’t seem to break, I knew I had to reframe the way I was prioritizing my daily tasks. Every day, after making my to-do list, I began to circle the top three things that would help me best serve God that day, and did those items first. While reading through the Bible in a Year for the first time, I needed some serious help sticking with it at first. So I started the year by writing “Bible reading” on my to-do list every day and circling it as a part of my top 3 ways to serve God that day. After a couple months of doing this, I stopped having to write it on my list at all! Spending time in God’s Word has become the way that I naturally start each work day. I stopped living under the lie that I was only successful if and when my to-do list was complete. By learning to discern the tasks that would help me best serve God each day, it freed me from feeling guilty when the other things didn’t get done. On evenings when I had a big test to study for, or a work deadline to meet, I would always be tempted to skip my small group or time in God’s Word. But there has never been a time when I was faithful to the tasks that best serve God, amongst a busy day or long to-do list, that important deadlines were not met. And the ones that weren’t met? It turns out they weren’t as important as the world lead me to believe. You don’t need an A+ in every class in order to serve God effectively. You can still be a positive influence on social media even if you aren’t posting on a regular basis. You can still run an effective business/career even if you’re a day or two late on a deadline. 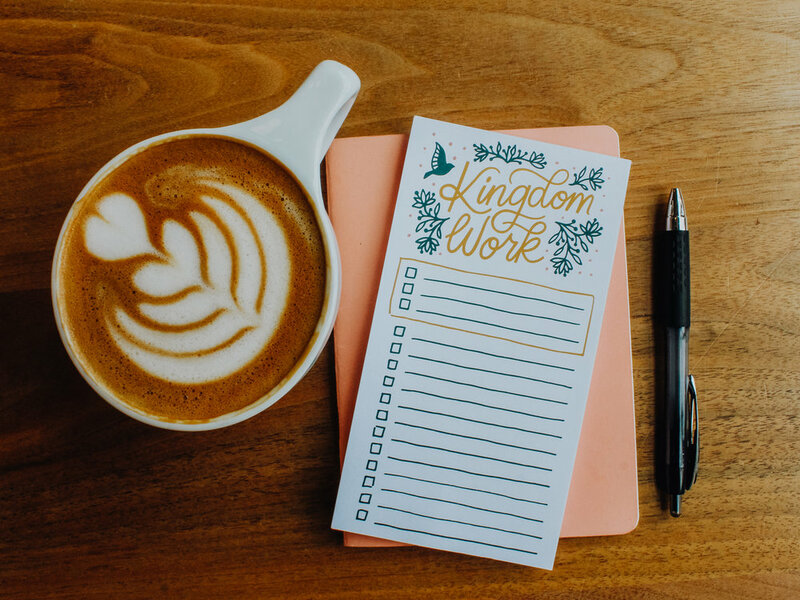 This is why I created the Kingdom Work Notepad— in hopes that it can serve as a visual and practical tool to help you “seek first his kingdom" every day. If you find yourself having a hard time choosing which tasks to set as your top 3, pray and ask the spirit to give you discernment. It may take some time, but God is patient and faithful in our every effort to put him first. Because even the days when it feels like there is so much left to be done, we can rest in the truth that Christ has done it all for us by his death on the cross, when he said “it is finished.” And through his resurrection, we already have the victory over death, guilt, sin, and shame. So let us choose whom we will serve today in light of that.